Hard to believe, but today marks your first full planet orbit around the sun since we Earthlings discovered you in 1846. I wasn’t invited to the official birthday party, but that’s okay, I’m happy to celebrate from afar because—no offense, Neptune—let me just say how glad I am to be an Earthling. For one thing, your days are shorter than here on Earth, but even shorter than we thought. Astronomer Erich Karkoschka recently discovered that instead of 16 hours and 6 minute days, your days are only 15 hours, 57 minutes, and 59 seconds. That’s a net loss of 8 minutes and 1 second. I just can’t sacrifice that much writing time. For another thing, from a distance you’re very beautiful—all that blue and all—but the truth is the blue color comes from the methane in your atmosphere, so I don’t think it smells all that good way up there. Which brings me to the third reason I’m really glad I’m not invited to your party: you’re so far away. It took the space probe Voyager 2, 12 years to reach you. I don’t like being away from home that long—especially when I’m hurtling through open outerspace. It also must be pretty dark and dreary there (even though you look so bright from afar)—Neptunians only get 1/900th as much sunlight as we Earthlings do….although, it would be nice to get away with never wearing sunscreen. All this is inconsequential anyway because where would I even stand on your planet? Although you have a very small, rocky core, you’re primarily composed of hydrogen, helium, methane with traces of ammonia and water. I’d never be on solid ground—and even if I was, I might get blown away because I hear it’s super windy there. Still, I think you must be very beautiful. You have nine moons, how romantic! And without the pesky sunlight, the stars must be amazing. So happy birthday Neptune, I’ll be thinking of you today and sending all Neptunians good wishes from this small Earthling 4.4 billion kilometers away. That was a COOL post! Personal and educational – a rare combination! I didn’t realize it was Neptunes birthday or I would have baked more cupcakes! Thanks for letting us in on the celebration…I can now justify that cookie cake I’ve been eyeing at the grocery store. That’s a net loss of 8 minutes and 1 second. I just can’t sacrifice that much writing time. * Pun on “rocky core” from your post, just in case that one was too obscure – LOL! Another reason one should be happy to be an Earthling? Wonderfully fun blog posts like this. Amanda, Yes, cookie cake is always appropriate for Neptune’s birthday (or for any other day of the week). Wow — Too cool, Julia!!!! What a great post. 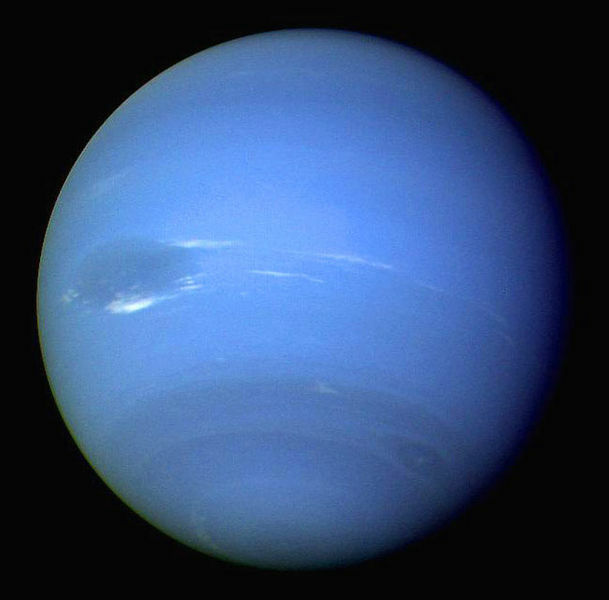 Being the geeky engineer (you can’t spell ‘Geek’ or ‘Engineer’ without a double-E after all), I love space and astronomy, and I never even realized that today was Neptune’s birthday! What a very cool idea for a post, AND how wonderfully written! Congratulations — you win my first-ever “Chris Fries Says You’re A Rockin’ Blogger” award!!! …um, there’s no logo, or widget, or anything. …and, well, no — there’s no cash prize, or publication, or certificate or anything. …and yeah — I did just make that award up, but dang it — you totally deserve it! This was so great! My husband was just mentioning Neptune’s birthday to me yesterday, but this was such a creative way to interpret all that information! What a fun and unexpected post to read this afternoon. Thanks for enlightening me on this trivia I knew nothing about. Natalia, Glad you enjoyed the post! Happy Neptune’s Birthday! Bike Lady, Glad you enjoyed learning a little more about the distant Neptune! Please add my name to the birthday card. This is so great! I love this post and love the fact that I now know it’s Neptune’s birthday. But I have to ask: How in the heck did you know?? I waited all day to read this! And, I must say, I’m glad I did. This was so fun, and fascinating. My daughter and I were, and are, totally flabbergasted by the statistics (we were just watching documentaries on the planets yesterday). Nice blog post. I used to teach astronomy–but your nose would be frozen before you go a whiff of methane, which by the way is odorless. They add a little essence of skunk to what they put in pipelines so the leaks will be obvious. Leah, Glad you loved the post! I live with an engineer and two science students — so I hear about all kinds of science-y stuff. But I heard about this through my NPR online news subscription! kidstuph, So glad you enjoyed it and commented! It really is amazing to learn all the planetary information, isn’t it!? You are so right about the commute — although think of the solitary writing time it would provide!! Sue Ann, I made the creative decision to omit the cold temp information in my post, but ARGH, of COURSE methane is odorless!!! (My two semesters of college chem flew out of my writer brain yesterday! 🙂 I’m glad for the reminder and for your visit and comment on my blog! So happy to meet you!